This is the island closest to Corsica and together with the islands Budelli and Santa Maria it forms the lagoon of Porto Madonna, It can be reached by boats rented in La Maddalena. It has little over 12 kilometres of coastline and a surface of 1.54 km2. 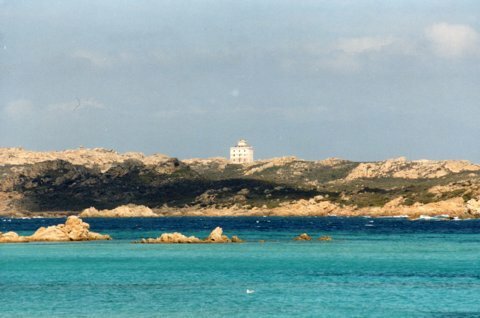 The highest point of this pink granite island is Monte Cappello (65 m). The uninhabited island of Razzoli is separated from the island of Santa Maria by the narrow Passo degli Asinelli. This island is fascinating due to its waters abounding in fish and, in particular, due to the many bird species which live undisturbed on the island. Razzoli is the ideal nesting place for Royal seagulls, Sardinian sparrows, cormorants and large shearwaters. Turtles, dolphins and seals had been living there for a long time before becoming the object of a fierce hunt by fishermen. Only small groups of dolphins can still be seen in the waters around the island. The local lighthouse signals the presence of the group of islands. The jagged coastline of the island forms enchanting coves such as Cala Lunga on the south-western side, which is the only accessible one. Here the sea plays hide-and-seek with the rocks and penetrates into the many small bays such as Cala dei Morti, Cala Calaccia, Cala del Rosario, Cala dell'Acqua and Cala del Bue Marino. This island can only be reached by boat. As the information above states, you can rent a boat from La Maddalena. The light can also be seen from the ferry that runs between Sardegna and Genova.